Strong clinical skills, marketing and business acumen, entrepreneurial talent, and technology savvy are all must-haves to build a solid private practice in today's challenging health care landscape. You may have recently daydreamed at your desk, on an impossibly busy day, about starting your own private practice. The idea of setting your own schedule, selecting which clients to work with, and earning a better salary sounds just perfect. But in today's complicated health care landscape, opening and building the best practice has its fair share of challenges. According to NASW, an estimated 650,000 people who hold social work degrees and roughly 170,000 licensed clinical social workers are in the United States. Many of these practitioners will take the leap and start a sole or group practice. People quickly discover that for a private practice to be successful it takes skills beyond being a good clinician. Business and marketing savvy, having the flexibility of an entrepreneur, and embracing technology are all necessary attributes. In addition to cultivating these skill sets, social workers in private practice will have to keep their finger on the pulse of the latest changes in federal and state policy. Two of the biggest policy leaps in the last decade have been the passage of the Affordable Care Act of 2010 (ACA) and The Wellstone-Domenici Mental Health Parity and Addiction Equity Act of 2008. Both laws have led to significant changes in the delivery and reimbursement of substance use and mental health treatment services. The good news is these laws have expanded insurance coverage, including Medicaid, and pushed the integration of mental health and health care. These laws also bring more opportunities for social workers to be at the center of offering services, especially since social workers provide most of the country's mental health care. 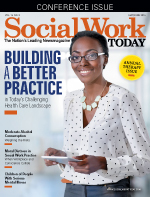 "The ACA has been helpful for private practitioners and Medicaid expansion has incorporated social workers into their reimbursement system," says Mirean Coleman, MSW, LICSW, CT, senior practice associate, who leads NASW's clinical practice specialty. "One example is in West Virginia, where private practitioners are now accepted to provide psychotherapy services. We are also receiving phone calls from primary care physicians looking for social workers to contract with to provide psychotherapy services." But while these changes are positive, they also present challenges for building a better private practice. Payment structures are changing, and third-party payers are requiring the delivery of outcomes-based services for reimbursement. Technology and better documentation practices will be required to plan and deploy treatment, and if standards are not adhered to, this could jeopardize practice profitability. "Clinical social workers in private practice are accustomed to the fee-for-service model, which will be replaced with outcomes-based care," says Michael Brooks, MSW, BCD (emeritus), former director of policy and business development for the Center for Clinical Social Work. "With the passage of the ACA there is a move to pay for performance with an outcome benefit and if your clients are actually getting better." Social workers may be wondering how this will impact the growth of their practice and what they need to do to prepare. According to Coleman, there is still time to plan and change should occur over the next five years. "The federal government and other regulators are trying to figure out the best way to do this. In the meantime, NASW is involved in high-level conversations to establish new payment models and how clinical social workers are integrated into primary care setting," Coleman says. Among the biggest topics of conversation among private practitioners is the struggle for a sole practitioner and small group practices to manage under new and more complex billing and documentation requirements from third-party payers while maintaining good pay rates. An NPR report from 2013 suggests that consolidation of mental health providers is imminent. In the article, Linda Rosenberg, CEO and president of the National Council for Behavioral Health, illustrates how therapists are dropping solo practices to join groups as a result of health care reform: "If you look at how many airlines there are today vs. 10 years ago, if you look at hardware stores vs. Home Depot and Lowe's, it's really a monopoly economy. And I think solo practitioners are now going to be employees of big systems." To Take Insurance or Not? Amidst all the trends and changes happening in health care, a core business decision for every private practitioner is whether or not to take health insurance. There is no right or wrong answer, but it is clear many factors come into play when making this decision. In January 2013, Emily Greenberger, LCSW-C, a licensed school social worker, and her husband, Brett Greenberger, MD, PC, a child and adolescent psychiatrist, took the plunge and opened the Collaborative Counseling Center, a private practice in Columbia, Maryland, focused on providing intensive outpatient services for children. For the Greenbergers, it was a scary to start their own business, but they both loved working with children and adolescents and saw a pressing need in their community. They had seen too many times how the disconnection between psychiatrists and therapists had a negative impact on care and how hard it was for families to slog through a fragmented care system that sorely lacked specialized services for children. "We wanted to be the Nordstrom of mental health care and provide a customer and family-centered focus," says Emily Greenberger, co-owner and clinical director at the Collaborative Counseling Center, as she describes the founding principle of their practice. "We created our practice with the one-stop-shop concept in mind so families could receive all their care from diagnosis to treatment in one place." When the Greenbergers launched their practice, in addition to creating a welcoming environment complete with Wi-Fi and soft music and sorting out the details of their location, insurance, and taxes, they had to make a core business decision about accepting health insurance. This would make or break the success of their practice for years to come. "We knew when we opened our doors, we couldn't take health insurance and it would take up to six months to be paneled and credentialed," according to Emily Greenberger. "Also, we couldn't afford a billing person or an outside company to process claims." After careful consideration the Greenbergers decided not to accept health insurance. They determined the affluent county where they were located, the lack of specialized services available for children, and the help they could offer families in submitting out-of-network claims would be enough to sustain their practice. Some might see this as a risky approach, but the gamble paid off. Today, the Collaborative Counseling Center is a thriving practice where they employ six additional clinicians who offer private counseling and various group sessions five days a week, seeing on average of 15 to 30 clients per day. This didn't happen overnight, and only recently did they reach a level of service for both of the Greenbergers to be dedicated full-time to their practice and sustain an income to support their family. Others have taken a different approach when setting up their business model and revenue streams. Samara Stone, LCSW-C, CEO of the The Stone Foundation Counseling Group, has managed a thriving group practice serving more than 100 clients weekly since 2005. "I accept just about every insurance out there because strategically it was the right thing to do and as a social worker I believe in accessibility," Stone says. "I want working families to have access to quality behavioral health care, so I do my part to make sure that happens by accepting a wide variety of insurance plans." In addition to running this private group practice, Stone also coaches others who want to open their own practice as founder and coach of Perfected Practice. She says, "I coach people to unpack and discover who the client will be, what type of practice they will create, and why they want to do this work in the first place." In working with many aspiring private practitioners she says, "People approach private practice because they think it is the next progressive step in their career, but that's not reason to hang a shingle." Stone and Greenberger echoed that if you want to grow a private practice, developing a sound infrastructure, deciding where to make key investments in operations and marketing, and selecting a specialty are the keys to success. There are many critical and potentially time-consuming administrative aspects (e.g., billing, taxes, and marketing), but it's necessary to maintaining a revenue stream. Also, social workers have to come to terms with the fact they are ultimately business owners and become more comfortable with earning money. "Social workers seem to feel uncomfortable about making money; it's our kryptonite, and this is historically part of our roots as a profession. It's like if social workers ask for money it's diluting the purity of the intention. This is beautifully genuine, but we should be concerned about sustainability. We can't provide a needed service if we're not profitable," Stone says. Practices can consider outsourcing their billing through companies, such as Kasa Solutions, or a local consultant in the community with specific knowledge about billing for mental health services. Sole practitioners have also opted to join group practices to pool administrative resources. Whether it is securing preauthorization with a payer, creating invoices, or keeping track of the latest policy changes and income, this becomes a part of the job and social workers must set aside time to do this to grow a private practice and continue serving a community. Even though the health care environment is focused on outcomes and measurement, clinical practice is still viewed by some as an art form and the clinician, an artist. The weaving together of theory and practice is a customized experience for every client. The encroachment of technology, as well as business administration, is sometimes viewed as time taken away from care. As health care changes move forward, technology is becoming the lynchpin for managing a clinical practice and building a business. How to utilize technology looms large in a social worker's ability to handle documentation, billing, and tracking outcomes; implementing an electronic health record (EHR) is a necessity. "I think social workers are being forced to adopt EHR systems and I don't think it's something that we have an option not to do because many third-party payers are connected to an electronic system," Coleman says. "It would be helpful for social workers to get on the bandwagon." But deciding which EHR or practice management system to utilize can leave your head spinning with almost too many options available. Julie Hanks, PhD, MSW, LCSW, an author and private practice consultant, offers some good advice on her website www.drjuliehanks.com about choosing the right EHR for your private practice and points out the importance for electronic data keeping for any business. Hanks tells readers instead of trying to research all the available EHR systems, focus on your needs first. If social workers understand their business and practice needs, they will be in a better position to select a system that is best for them. Practitioners can consider EHR systems that have helpful features such as to-do lists, appointment reminders, and scheduling. A system also needs to fit within a given budget and produce data reports to analyze revenue and referral sources. Hanks also mentions a few of the most popular systems, such as TheraNest, Simple Practice, and Therapy Notes, used by private practices. Other practitioners use Advanced MD, Valant, and Helper; TameYourPractice.com offers additional possibilities. Mike Sheppard, a general manager of private practice at Netsmart, describes their Helper system for private practices as evolving from a billing system to an EHR due to changes in health care that have influenced higher utilization of technology systems. "The ACA was a catalyst [for increase in customers] and what we have found is practitioners need to track outcomes to measure diagnosis and the course of treatment, which is daunting given the number of regimes and approaches," Sheppard says. "Technology provides the benefit of helping standardize, see trends, and keep track of the cost of care." Sheppard also points out that 15 years ago only one or two companies served private practices; now there are roughly 15 to 20, and possibly more software companies trying to address the needs of the private practitioners in both sole and group practices. "There is good innovation happening in the space which will give private practitioners many options to help deliver the best systems," he says. Sheppard also believes that technology companies are part of an ecosystem that drives the adaption of technology. As a partner with clinicians, providers, and third-party payers, companies have a responsibility to be compassionate in driving innovation and making better systems to deliver better care. As for how health care changes will ultimately impact care, Sheppard says. "We have seen payment model and insurance companies drive behaviors in the past around things clinicians don't necessarily like, but I'm hopeful, if the way care is paid for encourages more coordination of care, everyone would agree this is better for everyone." Technology is also impacting the delivery of care, with telehealth transforming practice, especially in rural areas across the country. Many might see this as a way to expand a private practice, but Coleman cautions, "Right now some third-party payers allow it and others do not. For example, Medicare allows those types of services through [secure] video conference. Also, it depends on your state board for social work licenses. The Association of Social Work Boards says you must be licensed in the state in which the client resides and receives the services, if you want to provide counseling either by telephone or online." Private practitioners have much to think about and plan for in building a better private practice. The ability to transform into entrepreneurs and business leaders in the community is a big part of this task. How social workers handle these additional roles will make a difference in building a better private practice throughout all of our communities. — Kristin Battista-Frazee, MSW, is a marketing consultant and freelance writer based in McLean, Virginia.